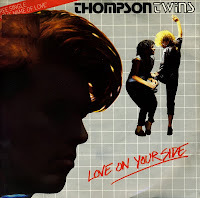 In the name of love was originally a song by the Thompson Twins released in 1982. After that, the group made it big with hits such as Doctor doctor, You take me up and Hold me now. While lead singer Tom Bailey apparently suffered a nervous breakdown, they continued to release music such as the less successful 1987 album 'Close to the bone' and a couple of compilation albums in 1988. 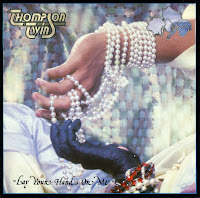 'The best of Thompson Twins: Greatest Mixes' featured a 1988 remix by Shep Pettibone, which was also released as a single. It peaked at number 46 in the UK singles chart. In 1983, Thompson Twins released their third album 'Quick Step and Side Kick', featuring the singles 'We are detective' and 'Watching'. The album reached number 2 in the UK albums chart and number 34 in the USA. The latter of the two singles is featured here. It peaked at number 33 in the UK singles chart. Even in 1984, this was still a regularly rotated video on satellite TV channels like Music Box. Joe Leeway left Thompson Twins in 1986, leaving Tom Bailey and Alannah Currie to carry on making music as a duo for another seven years. They released their first album as a duo in 1987, entitled 'Close to the bone'. 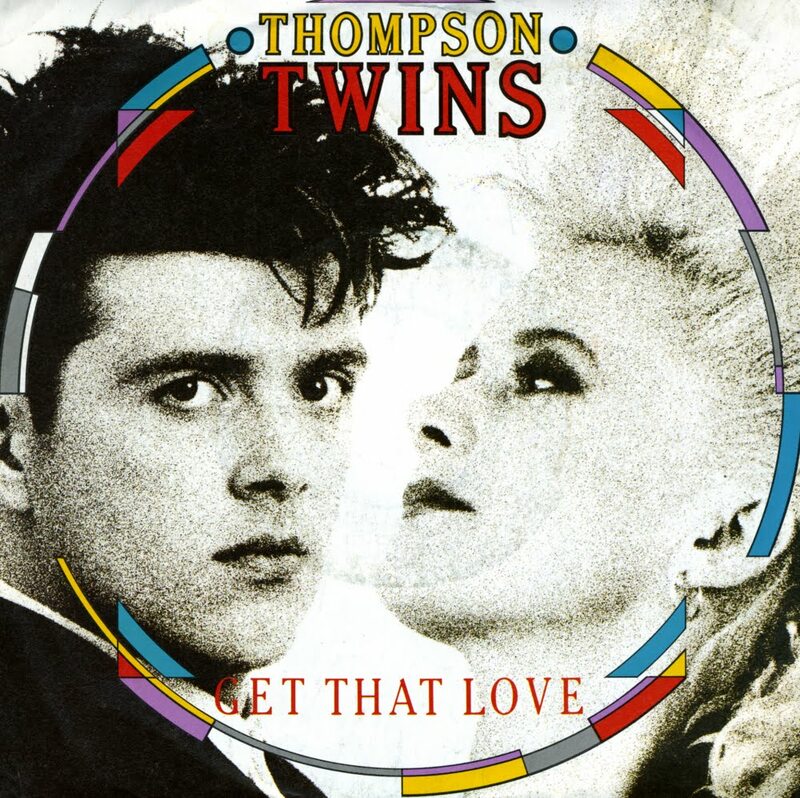 'Get that love' was the first single taken from that album. It reached number 31 in the US Billboard Hot 100 chart but failed to reach the charts in the UK and Europe. Following on from their hugely successful 1984 album 'Into the gap', the Thompson Twins experienced some troubles with their follow-up, 'Here's to future days' (1985). Frontman Tom Bailey was diagnosed with nervous exhaustion just before the release of the album and holding off on its release eventually led to reconsideration of the whole project. After Bailey's recovery, they re-recorded the album with producer Nile Rodgers taking over from Alex Sadkin. Still, the album turned out to be less successful than its predecessor. The singles, too, disappointed commercially. 'King for a day' flopped in many territories and only reached number 22 in the UK - although it still made number 8 in the US Billboard Hot 100 chart. 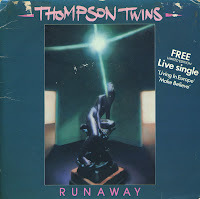 The single 'Runaway' by the Thompson Twins was the second single from their second album 'Set', and the follow-up to the American hit single 'In the name of love'. 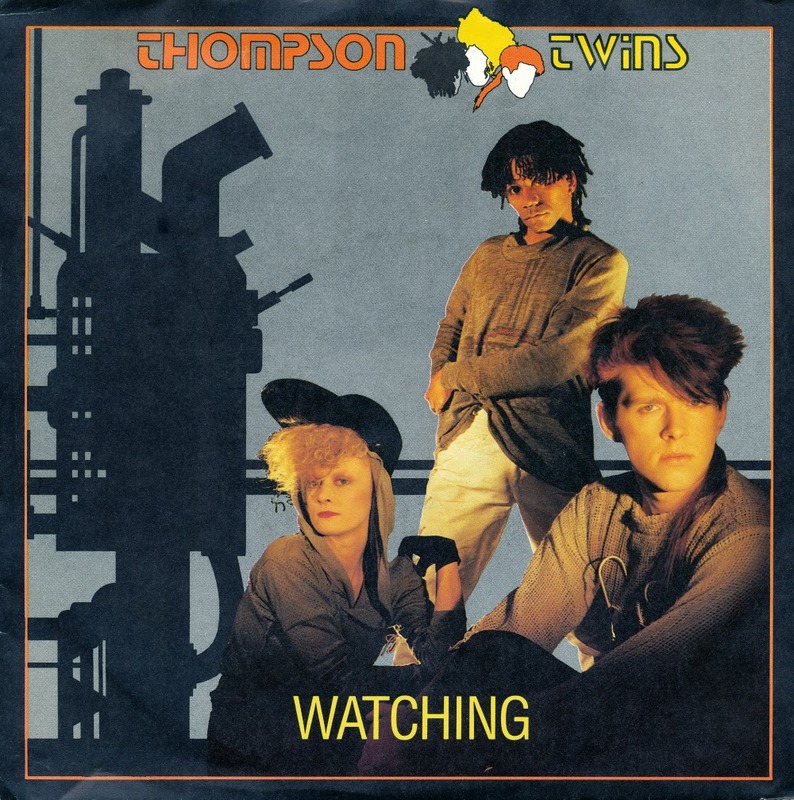 At the time of release, Thompson Twins was a seven piece band, consisting of later core members Alannah Currie, Tom Baily and Joe Leeway, along with Chris Bell, Peter Dodd, John Roog and Matthew Seligman. 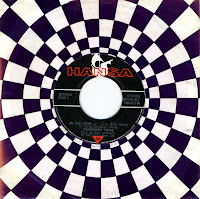 The single was released as a limited edition double single in the UK, featuring two live tracks on the second disc. It didn't help: the single flopped. 'Lies' was released as the first single from the Thompson Twins' fourth album 'Quick step and side kick'. This album was the result of songwriting sessions in Egypt and the Bahamas, followed by a recording session at Compass Point Studios in Nassau with producer Alex Sadkin. The single reached number 67 in the UK singles chart. When the single was released a year later in the USA, it reached number 30 in the US Billboard Hot 100 chart. 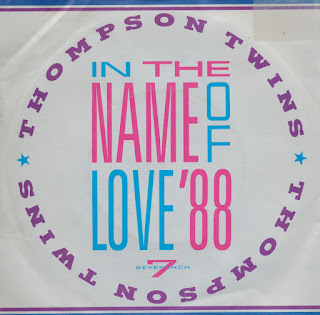 According to the German press bio enclosed in the sleeve of this single, the Thompson Twins were having trouble deciding on a single for Germany in the summer of 1983. 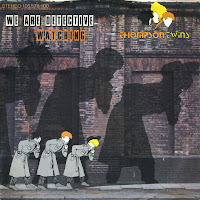 'We are detective' had just been a top 10 hit in the UK, and 'Watching' was due to be released soon. According to the bio, it was the band's female member Alannah Currie who proposed to release a double A-side single in Germany, including both singles. Joe Leeway left the Thompson Twins in 1986, leaving Tom Bailey and Alannah Currie to continue as a duo. They carried on making music for another seven years. Their first release as a duo was 1987's 'Close to the bone'. 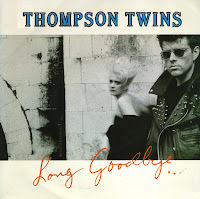 'Long goodbye' was the second single to be taken from the album, but it was even less successful than the first single, 'Get that love', which reached number 66 in the UK singles chart. This single stalled at number 89. Although one more single was released ('Bush baby'), that one did not chart at all. While working on the follow up to 'Into the gap', Thompson Twins band member Tom Bailey suffered a nervous breakdown. Nile Rodgers was subsequently called in to help finish the album 'Here's to future days', which was released in September 1985. The first single from the album was 'Don't mess with doctor dream', a track with a strong anti-drug message. The single reached number 15 in the UK singles chart and number 27 in the Dutch Top 40. 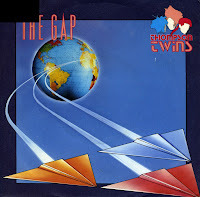 While in the UK the Thompson Twins released a special single version of 'Sister of Mercy', the German record company decided that the album track 'The gap' was the better single choice. It was also released in the USA, where it reached number 69. 'Sister of mercy' does appear on the B-side of this single, incidentally, but that is the album version of the track. 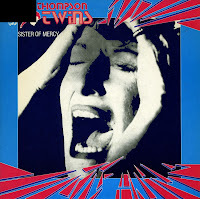 'Sister of mercy' was the fourth single taken from the Thompson Twins' hugely successful 1984 album 'Into the gap'. The single version was different from the album version, in that it started out as a ballad. 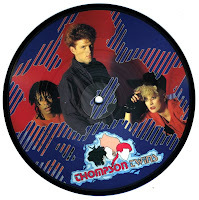 The B-side was a megamix of wellknown Thompson Twins tracks, such as 'We are detective', 'Into the gap' and 'Hold me now'. The single reached number 11 in the UK singles chart, but did not chart in other territories. 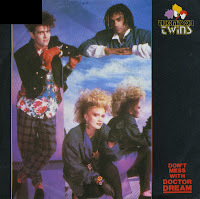 'Doctor doctor' was the second single taken from Thompson Twins' hugely successful 1984 album 'Into the gap'. It reached number 3 in the UK singles chart, which was an improvement on the number 4 reached by the previous single, 'Hold me now'. In the Netherlands, 'Doctor doctor' reached a more modest number 24. 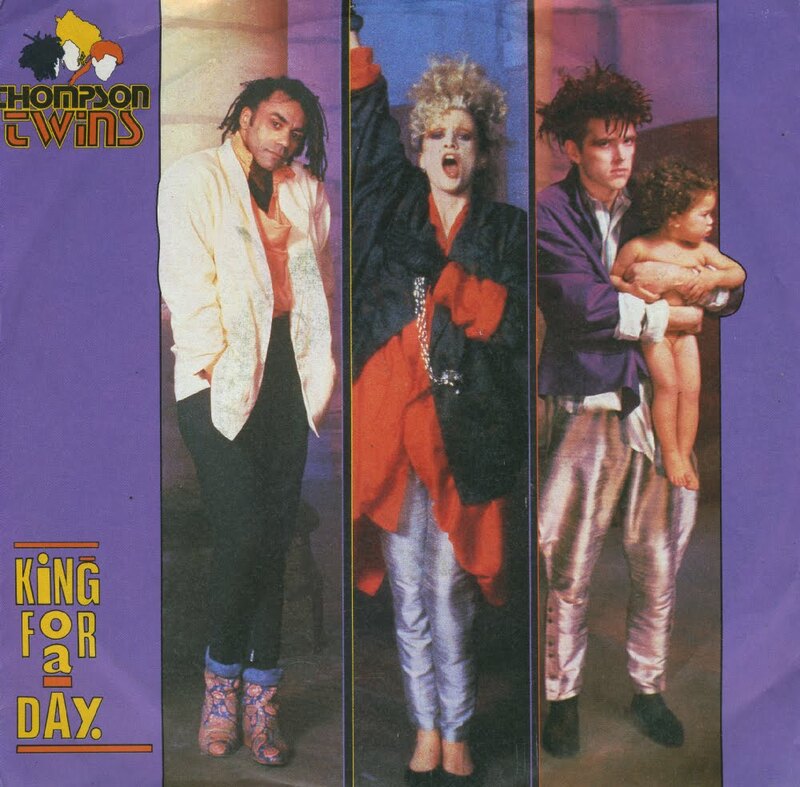 In 1984, the Thompson Twins scored the biggest hit of their career in the UK: 'You take me up' reached number 2 in the UK singles chart and earned the band a silver disc. The album from which the single was taken, 'Into the gap', was one of the biggest sellers of the year, topping the British album charts and selling over five million copies worldwide. In the Netherlands, the single did not chart. I think the Dutch were right: this wasn't the best single the Thompson Twins ever released, however entertaining it was. The music video was amusing, but forgettable as well. I was quite shocked to find that I had to pay 5 guilders for this picture disc six years after its release, while the song was never a hit in the Netherlands. But oh well, it was still worth it. 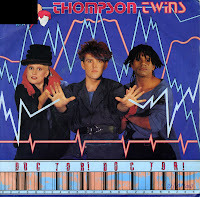 Thompson Twins found themselves functioning as a trio as of 1982. 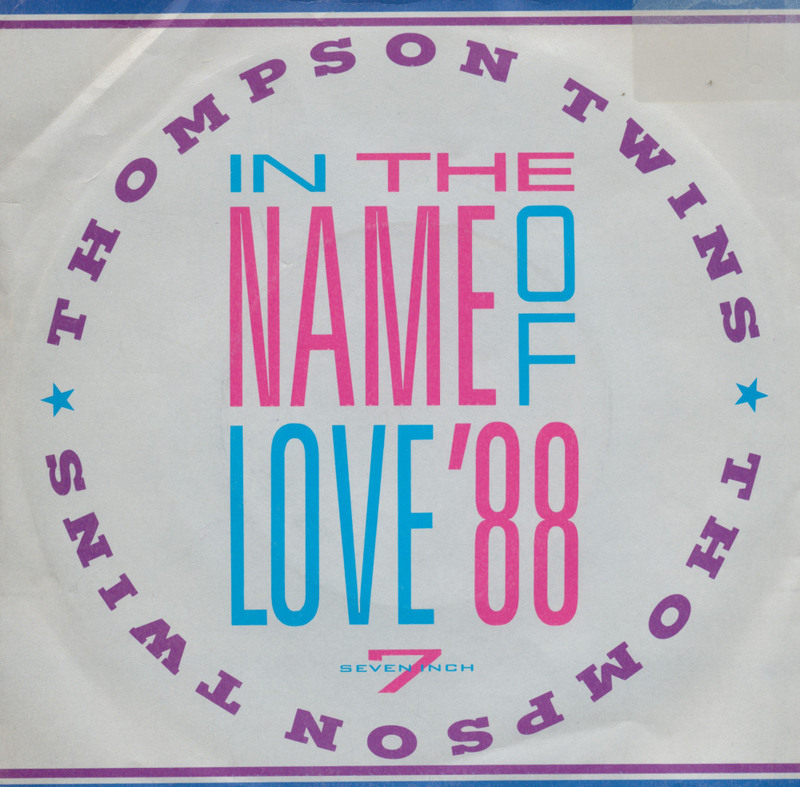 The single 'In the name of love' had become a hit, and Tom Bailey, Alannah Currie and Joe Leeway wanted to pursue the single's different sound. They toyed with the idea of starting a new band on the side, which they planned to call 'The Bermuda Triangle'. John Hade, their manager, convinced them to downsize their original band, Thompson Twins. Their first hit as a trio was 'Love on your side', a track that even quoted 'In the name of love' for a few seconds. The single reached number 9 in the UK singles chart (their first top 10 hit in the UK) and number 20 in the Dutch Top 40. This limited edition double single features the earlier single 'In the name of love' as disc 2. 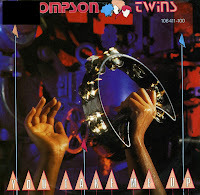 Thompson Twins formed in 1977. The original line-up consisted of Tom Bailey, Pete Dodd, John Roog and Jon Podgorski. By 1981, Podgorski had left and three new members had joined: Chris Bell, former band roadie Joe Leeway and Jane Shorter. After their debut album, Shorter left, to be replaced by Alannah Currie. The band then signed to Arista Records and released their second album 'Set'. From this album, the single 'In the name of love' was taken. Although the single did not chart in the UK, it was a top 40 hit in the Netherlands, peaking at number 27. This edition, made in Germany, was pressed on red vinyl. 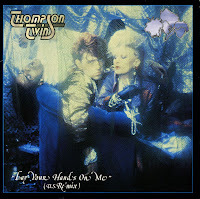 After the release of the original version of 'Lay your hands on me', a US remix version followed pretty quickly. Remixed by one John Potoker, the track had become different, but not necessarily better or worse. While the original version was released in a limited edition posterbag, this US remix appeared in a gatefold sleeve. I got very confused: did I have this already or not? In the end, I took the gamble. I'm glad I did, now I've got both versions. The Thompson Twins enjoyed a lot of success with their 1984 album 'Into the gap'. They had to come up with a new album soon, so the writing and recording of the next album 'Here's to future days' began in late 1984. The band recorded the single 'Lay your hands on me' with producer Alex Sadkin. The new single climbed to number 13 on the UK singles chart. My copy of the single came in a limited edition poster bag. I might never have bought it otherwise: I thought the track was a lot weaker than previous singles. Nowadays I feel differently: it still sounds rather fresh.